When you're in the mood to bake and are craving a cool cookie, but also enjoy a delicious surprise. These cookies are for you. Source: What's Gaby Cooking by Gaby Dalkin. The recipe is available online, here! Tips for Bakers: When making these cookies gluten free, be sure to use your favorite kind of gluten free flour. We always use Cup4Cup which works like a charm. This is the only change to the recipe necessary for them to be GF. Also, since I only had unsweetened coconut flakes at home, I used those instead of sweetened as the recipe requests. While the recipe does not say to toast the coconut flakes, I chose to do so which resulted in my kitchen smelling incredible, and the coconut having a wonderful, toasty-roasty (that's an official term) flavor. I'd suggest toasting the coconut flakes, and letting them cool completely, before incorporating them into the cookie dough. In regard to time, the process for making this dough is very quick! However, since you're told to chill the dough for at least two hours, you may want to make the dough first thing in the morning, then go out for coffee, head to the gym, do some shopping, or just read a good book while it hangs in the fridge. A necessary step to ensure the cookies will be as scrumptious as advertised. One note on the baking: the recipe states to bake the cookies for about ten minutes. I found that they needed a little longer than that so my final cook time was about twelve minutes. However, all ovens run a little different so watch the cookies closely after the ten-minute mark. You'll want them just slightly golden on the edges. And while the cookies will appear slightly too light when done, don't worry! They'll be terrific: crispy edges and soft, chewy centers. The ideal cookie consistency combo, in my opinion. GFMD Taste Test: We loved them! 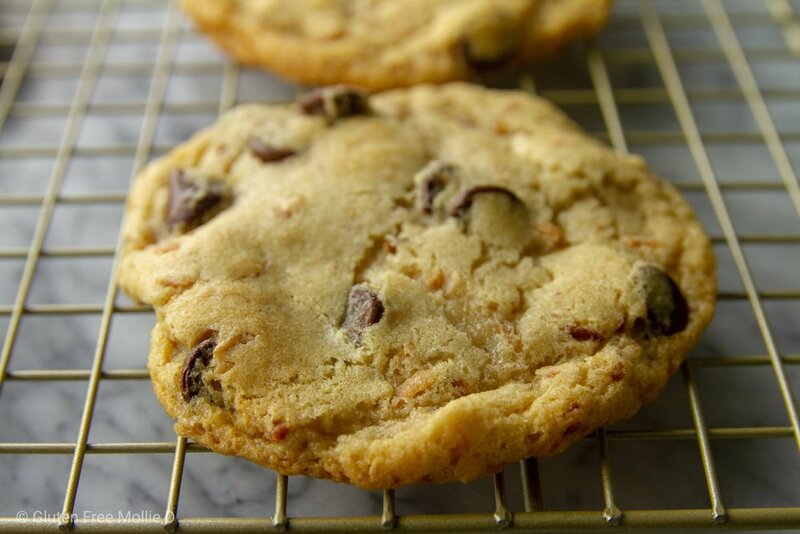 A delicious, sweet treat that's very much the essence of a classic chocolate chip cookie with the fun surprise of the toasted coconut. I loved the addition of the coconut because it jazzed up the overall flavor and, again, added a surprise element to the cookie. For the next time I bake these, I'll probably increase the amount of chocolate chips and the amount of coconut. This batch had one cup of each, but next time I may add another half cup. Although, the cookie lovers in your life may think the current ratio is just perfect. Seth loves cookies "extra chippy," so I know he'd appreciate the increase. And I really loved the coconut so increasing that would make me a happy camper, too. Speaking of camp, these would be a delicious treat to mail to a camper this summer. What a package that would be! These cookies were scrumptious out of the oven, but they really shined (to me) one day after baking them. I'm not sure what changed, but I thought the flavor was even better and the texture just right when I ate one (or two) the next day. May I suggest? 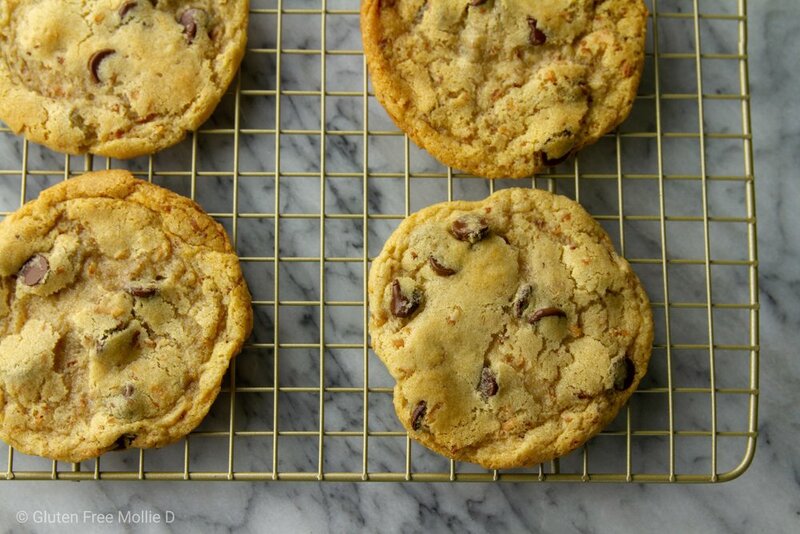 For my ever-expanding list of cookie options, I'm adding these to the "easily shared" category. This cookie is perfect for a large group gathering, a birthday party, part of a care package, or just to have around when you know company could be dropping by. The recipe yield is three dozen which is a lot of cookies!